After escaping from the circus where he lived until now, the son of Chucky and Tiff figures out who his parents are and set up to bring them back to life. 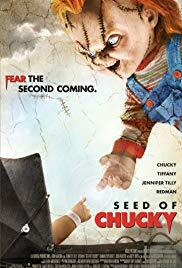 The previous sequel of Child’s Play, namely Bride of Chucky, already kind of stopped taking itself seriously and introduced a comedy/parody twist to the franchise. Here, this fifth sequel is now completely comedy-oriented – and features a hilarious Chucky and his lovely murderous family. 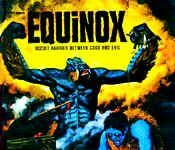 Personally, I found the mixture brilliant and held this movie as one of my biggest guilty pleasures, despite knowing very well that it is a rather bad movie indeed. The story is, let’s face it, bad. But the totally grotesque humor totally compensate for it. It might be too much at times (you get to see Chucky masturbating, artificial insemination scene, etc. ), but you’re in for a good laugh. Fans of silly horror comedy such as Scary Movie will love it. In a similar fashion, horror lovers will find multiple references to classic horror movies in it, and even to the Child’s Play franchise itself. I usually doesn’t like this type of outrageous humor, but I found this movie to be well-balanced with some good horror, a great amount of gore, an plenty of hilarious moments! A lot of silly fun!